Tag line: "The true story of a mild mannered banker and his magnificent obsession"
Dan Mahowny (Philip Seymour Hoffman) works as an assistant manager for a large Toronto-based bank. With his low-key idiosyncrasies and professional work ethic, Mahowny is the consummate professional, a man who serves his customers while keeping a sharp eye on the bank’s bottom line. He's smart, well respected, and a person you can depend on to get the job done. Dan Mahowny is also a compulsive gambler, one who's embezzled over $10 million from his employers to feed a habit he can no longer control. Owning Mahowny, directed by Richard Kwietniowski, tells both sides of his story. Based on an actual event that occurred in Toronto in the early 1980’s, Owning Mahowny is the detailed study of a man who lived two lives, until the day one finally took control of the other, bringing both crashing down around him. At the outset, Mahowny concealed his addiction from those closest to him, including his girlfriend, Belinda (Minnie Driver), who never once suspected that the man she loved flew to Atlantic City every weekend, dropping tens of thousands of dollars before finally returning home to her. In fact, Mahowny became such a regular at one casino that its President, Victor Foss (John Hurt), started treating him as if he were a member of the royal family. Yet while Mahowny’s repitation as a gambler grew, so did the danger of his being discovered, and in the end, it proved more than he could handle. Philip Seymour Hoffman gives a remarkably reserved performance as Mahowny, a man who has so perfected his “poker face” that he's able to wear it 24 hours a day, seven days a week. He loves gambling as if it were a member of the family, and his overwhelming desire to “push the envelope” becomes so addicting that it soon extends beyond his personal life and into his professional. Mahowny slyly withdraws millions against the loan account of the bank’s biggest customer, claiming he's doing so on their behalf. Then, to get his hands on even more money, he opens a fictitious loan account, one he approved personally, and starts withdrawing heavily from it. Having made a career out of being a shrewd, careful administrator, Mahowny was now taking staggering risks. Dan Mahowny the professional was slowly disappearing, allowing Dan Mahowny the gambler to take up full-time residence. 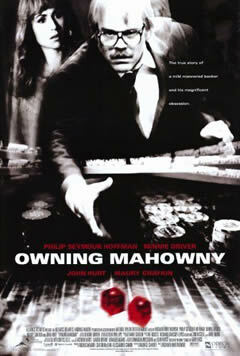 The chances taken by the title character in Owning Mahowny, both at and away from the gambling table, are mind-blowing. Yet while Dan Mahowny undoubtedly lost control of his life, we sense that, in the end, it was a sacrifice he was willing to make. For Mahowny, gambling was living, and every moment he spent away from his obsession was a moment wasted. So much so that, in the end, he wasn’t wasting any time at all. I really liked this one, Doc. Been a while since I've seen it. I saw one recently on IFC called Edmond that kind of reminded me of this movie. Anyway, love your site as always. Keep 'em coming! @Boss: Thanks for stopping by, and for the comment! Always nice to hear from a fellow Horror Jungle host! I haven't seen EDMOND yet, but if it's like this movie, I'll definitely have to check it out. Take care, Boss, and thanks for the recommendation! Talk to you soon.